Jorge Ramirez’s father says nearly nine months after the shooting, police still will not let the family retrieve Ramirez’s belongings, including his wallet, keys and clothes. They say the department says it’s because the shooting is still under investigation. Ramirez was killed in a shootout with police in the parking lot of the Sheraton Hotel at Mohawk Street and California Avenue, September 16, 2013. Officers say Ramirez led them there, with fugitive parolee Justin Harger. Police say Harger opened fire on them as they approached his vehicle. Officers say Ramirez refused to comply with their orders and took shelter behind the same car Harger was firing from. In January, an internal review board ruled those officers: Daniel Brewer, Rick Wimbish, Ryan Vaughn, Jess Beagley and Chad Garret were justified in the shooting. 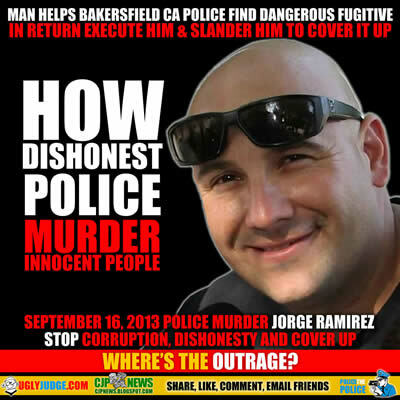 Officials with the Bakersfield Police Department say they cannot comment on the case. More than 50 police officers involved in fatal shootings this year had previously fired their guns in deadly on-duty shootings, according to a Washington Post investigation. For a handful of officers, it was their third fatal shooting. For one officer, it was his fourth. The findings concerned many law enforcement experts, who said that most officers never fire their weapons on the job. The analysis also exposed another gap in the federal government’s oversight of fatal police shootings nationwide: the absence of a system for tracking multiple shootings by individual officers. The 55 officers were identified as part of a Post project tracking all fatal shootings by police in the line of duty in 2015. It is the first nationwide attempt to determine whether fatal police shootings are isolated events in an officer’s career or whether some officers repeatedly fire their weapons in deadly encounters. The Post also found that an additional 45 officers had previously been involved in non-fatal shootings. Did BPD officers botch attempt by informant to help bring in a dangerous suspect? If Police are so concerned why are they miss-reporting the facts about their problem officers?